Star Trek: The Animated Series (TAS), originally aired as Star Trek and as The Animated Adventures of Gene Roddenberry's Star Trek, is an American animated science fiction television series created by Gene Roddenberry. It originally aired from September 8, 1973, to October 12, 1974, on NBC, spanning 22 episodes over two seasons. The second series in the Star Trek franchise, it is the first sequel to Star Trek: The Original Series. Set in the 23rd century, when Earth is part of a United Federation of Planets, it follows the adventures of the Starfleet vessel USS Enterprise as it explores the Milky Way galaxy. After the cancellation of The Original Series in 1969, the live action show proved popular in syndication and generated significant fan enthusiasm. This resulted in Roddenberry's decision to continue the series in animated form. Much of the original cast returned to provide voice-overs for their characters. Show writers David Gerrold and D. C. Fontana characterized The Animated Series as effectively being a fourth season of The Original Series. The adventures of the characters were continued in cinematic form, the first being the 1979 film Star Trek: The Motion Picture. The Animated Series was the original cast's last episodic portrayal of the characters until the "cartoon-like" graphics of the Star Trek: 25th Anniversary computer game in 1992 as well as its sequel Star Trek: Judgment Rites in 1993. Both appeared after the cast's final film together, Star Trek VI: The Undiscovered Country, released in December 1991. 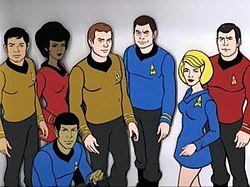 The Animated Series was critically acclaimed and was the first Star Trek series to win an Emmy Award when its second season won the 1975 Emmy for Outstanding Entertainment – Children's Series. The Animated Series featured most of the original cast voicing their characters. The major exception was the character of Pavel Chekov (Walter Koenig), who did not appear in the series because the series' budget could not afford the complete cast. He was replaced by two animated characters who made semi-regular appearances: Lieutenant Arex, whose Edosian species had three arms and three legs; and Lieutenant M'Ress, a female Caitian. Besides performing their characters Montgomery Scott and Christine Chapel, James Doohan and Majel Barrett also performed the voices of Arex and M'Ress, respectively. Initially, Filmation was only going to use the voices of William Shatner, Leonard Nimoy, DeForest Kelley, Doohan and Barrett. Doohan and Barrett would also perform the voices of Sulu and Uhura. Nimoy refused to voice Spock in the series unless Nichelle Nichols and George Takei were added to the cast—claiming that Sulu and Uhura were of importance as they were proof of the ethnic diversity of the 23rd century and should not be recast. Nimoy also took this stand as a matter of principle, as he knew of the financial troubles many of his Star Trek co-stars were facing after cancellation of the series. Koenig was not forgotten, and later wrote an episode for the series, becoming the first Star Trek actor to write a Star Trek story. Koenig wrote "The Infinite Vulcan", which had plot elements from the original Star Trek episode "Space Seed" blended into it. As is usual with animation projects, the voice actors did not perform together but recorded their parts separately to avoid clashing with other commitments. For example, William Shatner, who was touring in a play at the time, recorded his lines in whatever city where he happened to be performing and had the tapes shipped to the studio. Doohan and Barrett, besides providing the voices of their Original Series characters and newcomers Arex and M'Ress, performed virtually all of the "guest star" characters in the series, except for a few notable exceptions such as Sarek, Cyrano Jones and Harry Mudd, who were performed by the original actors from The Original Series. Other occasional guest voice actors were also used, including Ed Bishop (Commander Straker on UFO) who voiced the Megan Prosecutor in "The Magicks of Megas-tu", and Ted Knight who voiced Carter Winston in "The Survivor". Nichelle Nichols also performed other character voices in addition to Uhura in several episodes, including "The Time Trap" and "The Lorelei Signal". While exploring on the outermost rim of the galaxy the USS Enterprise is pulled into the orbit of a dead star. Trapped there, the crew discovers that there is an ancient derelict pod ship trapped with them as well. The Enterprise encounters a giant cloud creature that feeds on the energy of the planets that lie in its path. They determine it is heading for Mantilles, home to a Federation colony governed by former Starfleet officer Bob Wesley (featured in the ST/TOS episode "The Ultimate Computer)". Investigating a sector of space where starships have disappeared every 27 years, the Enterprise finds a race of beautiful women living on the planet Taurus II. While the USS Enterprise escorts two robot cargo ships carrying quintotriticale, a new seed grain, to famine stricken Sherman's Planet, it encounters a Klingon battlecruiser pursuing a Federation scout ship. When the Enterprise rescues the pilot, the Klingons attack with a new energy weapon and demand that the pilot be handed over to them. Patrolling near the Romulan Neutral Zone, the USS Enterprise finds a ship manned by Carter Winston, a Federation citizen and philanthropist who has been missing for five years. While visiting the newly discovered planet Phylos, Lieutenant Sulu picks up a walking plant, called a Retlaw, and is poisoned. The alien species that inhabit the planet, who are plantlike beings, approach and save Sulu's life. While exploring near the center of the galaxy, the USS Enterprise is caught inside an energy/matter vortex and all her computer systems fail. A being named Lucien appears on the bridge, repairs the ship's systems and takes the crew to explore his planet, Megas-Tu. The Enterprise crew revisits the "amusement park" planet first seen in the Classic Trek episode "Shore Leave" hoping for some rest and relaxation. The USS Enterprise receives orders to arrest Federation outlaw Harry Mudd, who is accused of selling fake love crystals. Intercepting Harry on the mining colony of Motherlode, they bring him aboard the Enterprise. While observing a burnt-out supernova, the USS Enterprise picks up a strange message transmitted in a two-hundred-year-old code. While exploring the Delta Triangle, where many starships have disappeared, the USS Enterprise is attacked by several Klingon vessels. During the battle, they are caught in an ion storm. The Enterprise and one Klingon battlecruiser are drawn into a spacetime vortex and end up in a timeless dimension. While exploring the water planet Argo, Captain Kirk and Mr. Spock are transformed into water breathers by the planet's undersea inhabitants, the Aquans. In order to return to their normal selves, they must enlist the help of the Aquans to capture a giant sur-snake, whose venom holds the antidote. In the shuttlecraft Copernicus, Mr. Spock, Uhura and Sulu are en route to Starbase 25 to deliver a stasis box—a rare artifact of the Slaver culture when the Kzinti intervene. The disappearance of a scientific team lures the USS Enterprise to investigate near Lactra VII. The starship Ariel is located there, abandoned, with its captain having transported to the planet's surface. The USS Enterprise arrives at the Vedala asteroid, where Captain Kirk and Mr. Spock have been summoned to learn about a stolen religious artifact, the "Soul of the Skorr", whose theft could ignite a galactic holy war. Spock contracts a fatal illness, and the cure can only be found with dangerous Orion pirates. The Enterprise crew is taken captive by a race of primitives on a newly discovered planet. A strange energy field causes the Enterprise computer to play practical jokes on the crew, but the humor soon turns to danger. Doctor McCoy is arrested for allegedly causing a deadly plague which once ravaged the planet Dramia. A mysterious being threatens to destroy the Enterprise if the crew is unable to solve an ancient puzzle. An unusual spaceship pulls the Enterprise into a "negative universe" where time seems to flow backwards. Similar to most animated series of the era, the 22 episodes of TAS were spread out over two brief seasons, with copious reruns of each episode. The director of the first season (16 episodes) was Hal Sutherland and Bill Reed directed the six episodes of season two. All of this series' episodes were novelized by Alan Dean Foster and released in ten volumes under the Star Trek Logs banner. Initially, Foster adapted three episodes per book, but later editions saw the half-hour scripts expanded into full, novel-length stories. Star Trek: The Animated Series was the only Star Trek series not to be produced with a cold open ("teaser"), instead starting directly with the title credits sequence. However, some overseas versions of the original live action series, such as those aired by the BBC in the United Kingdom in the 1960s and 1970s, were edited to run the teaser after the credits. "More Tribbles, More Troubles" was written by David Gerrold as a sequel to his episode "The Trouble with Tribbles" from the original series. Here Cyrano Jones is rescued from the Klingons, bringing with him a genetically altered breed of tribbles which do not reproduce but do grow extremely large. (It is later discovered that these are really clusters of tribbles who function as a single tribble, and it is decided that the large numbers of smaller tribbles are preferable to the larger ones.) The Klingons, because of their hatred of tribbles, are eager to get Jones back because he stole a creature they created: a predator called a "glommer" that feeds on tribbles. "Yesteryear" is a time-travel episode in which Mr. Spock uses "The Guardian of Forever", a time gateway from the original series episode "The City on the Edge of Forever", to travel back to his own childhood. This is the only animated Trek episode written by original series and later Next Generation writer D. C. Fontana. This was the first actual appearance of Spock's pet sehlat, first mentioned in "Journey to Babel" and finally named I-Chaya in this episode. One element from Yesteryear that has become canon by depiction within Star Trek: The Original Series is the Vulcan city of ShiKahr, depicted in a background scene wherein Kirk, Spock and McCoy walk across a natural stone bridge (first depicted in Star Trek III: The Search for Spock) in the remastered "Amok Time". Elements of Spock's childhood from "Yesteryear" are also referenced in the Star Trek: The Next Generation episode "Unification" as well as the 2009 Star Trek feature film. Larry Niven's "The Slaver Weapon", adapted from his own short story "The Soft Weapon". It includes some elements from his Known Space mythos such as the Kzinti and the Slavers. This is the only Kirk-era television or movie story in which Kirk did not appear. This episode is also the only animated one in which characters are shown dying or being killed. 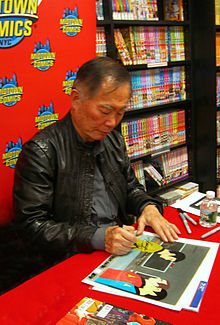 Actor George Takei autographing an original animation cel from the series at Midtown Comics in Manhattan. In the original Star Trek series, the title character was given the name James T. Kirk. It was not until the animated series that writer David Gerrold replaced the "T", giving us Captain James Tiberius Kirk. It was purely coincidental that he chose "Tiberius" (on Gene Roddenberry's first series The Lieutenant, the principal character was William Tiberius Rice). According to Gerrold, he had been influenced by I, Claudius, and had approached Roddenberry with his choice of middle name, but it was not until 2014 that he learned of its earlier use. The animated series introduced a three-armed, three-legged alien member of the bridge crew with a long neck named Arex and a cat-like alien crew member named M'Ress. The USS Enterprise in this series, while supposedly the same ship as from the original series, had a holodeck similar to the one later seen in Star Trek: The Next Generation, which was set about eighty years later. It only appeared once, in Chuck Menville's "The Practical Joker", and was known as the "Rec Room". This feature was originally proposed for the original series but was never used. A personal force field technology known as the life support belt was seen only in Star Trek: The Animated Series. In addition to supplying the wearer with the appropriate atmosphere and environmental protection, it permitted the animators to simply draw the belt and yellow glow around the existing characters, instead of having to redraw them with an environmental suit. A version of the life support belt later appeared in an early Star Trek: The Next Generation novel, The Peacekeepers, where they were referred to as "field-effect suits". "Turnabout Intruder", in which Dr. Janice Lester took over the body of Captain Kirk and assumed command. "The Lorelei Signal" and "The Infinite Vulcan", the latter written by Walter Koenig, are rare occurrences where Captain Kirk comes close to actually saying, "Beam me up, Scotty" (long erroneously believed to be a Star Trek catchphrase), when he commands "Beam us up, Scotty". Star Trek IV: The Voyage Home arguably comes closer to it by having Kirk say "Scotty, beam me up". An anti-pollution public service announcement was created for non-profit Keep America Beautiful featuring the ST: TAS characters and original cast voices. In the ad, the Enterprise encounters the "Rhombian Pollution Belt". The ad ran during Saturday morning network programming during the series' run. The animated series also dispensed with the original series' theme music, composed by Alexander Courage, in favor of a new theme credited to Yvette Blais and Jeff Michael (actually Filmation composer Ray Ellis, working under a pseudonym). This has never been publicly explained; one possible explanation is that the producers wished to avoid having to pay royalties for using the original theme. At the end of the first season of Star Trek: The Next Generation, all licenses for Star Trek spin-off fiction were renegotiated, and the animated series was essentially "decanonized" by Gene Roddenberry's office. Writers of the novels, comics and role-playing games were prohibited from using concepts from the animated series in their works. Among the facts established within the animated series that were called into question by the "official canon" issue was its identification of Robert April as the first captain of the USS Enterprise in the episode "The Counter-Clock Incident". Arguments about "canon" are silly. I always felt that Star Trek Animated was part of Star Trek because Gene Roddenberry accepted the paycheck for it and put his name on the credits. And DC Fontana—and all the other writers involved—busted their butts to make it the best Star Trek they could. But this whole business of "canon" really originated with Gene's errand boy. Gene liked giving people titles instead of raises, so the errand boy got named "archivist" and apparently it went to his head. Gene handed him the responsibility of answering all fan questions, silly or otherwise, and he apparently let that go to his head. I suppose "canon" means what Gene Roddenberry decided it was. Remember, we were making it up as we went along on the original series (and on the animated one, too). We had a research company to keep us on the straight and narrow as to science, projected science based on known science, science fiction references (we didn’t want to step on anyone's exclusive ideas in movies, other TV shows, or printed work). They also helped prevent contradictions and common reference errors. So the so-called canon evolved in its own way and its own time. For whatever reason, Gene Roddenberry apparently didn’t take the animated series seriously (no pun intended), although we worked very hard to do original STAR TREK stories and concepts at all times in the animated series. Since Roddenberry's death in 1991, and the subsequent exit of Richard H. Arnold (who vetted the licensed tie-ins for Roddenberry's Star Trek office at Paramount during its later years), there have been several references to the animated series in the various live-action series. In the Star Trek: Deep Space Nine episode "Once More Unto the Breach", Kor referred to his ship, the Klothos, which was first named in the TAS episode "The Time Trap". Other DS9 episodes to make reference to the animated series include "Broken Link", where Elim Garak mentions Edosian orchids (Arex is an Edosian) and "Tears of the Prophets" where a Miranda-class starship is called the USS ShirKahr (sic) after ShiKahr, the city from "Yesteryear". In the episode "Prophet Motive" where the title of healer is resurrected from "Yesteryear" as well. Vulcan's Forge is also mentioned in "Change of Heart", in which Worf wants to honeymoon there with Jadzia Dax, as well as in episodes "The Forge", "Awakening" and "Kir'Shara" from Star Trek: Enterprise. The Star Trek: Enterprise episodes "The Catwalk" and "The Forge" included references to "Yesteryear", the latter featuring a CGI rendition of a wild sehlat. The remastered Original Series episode "Amok Time" featured ShiKahr in the background as Spock beams up at the episode's ending, and the remastered version of "The Ultimate Computer" replaced the Botany Bay-style Woden with an automated grain carrier from "More Tribbles, More Troubles". The 2009 film Star Trek also references "Yesteryear", featuring a nearly identical scene in which a young Spock is confronted by several other Vulcan children, who bully and provoke him for being part human. The 2017 series Star Trek: Discovery episode "Context is for Kings" has Spock's foster sister Michael Burnham state that their mother Amanda read Alice in Wonderland to them as children, as in the episode "Once Upon a Planet." The second season episode "Light and Shadows" expands on Amanda's reasons for doing so. A race introduced in the episode "The Jihad", represented by a character named M3 Green, is named the Nasat in the Starfleet Corps of Engineers e-book novellas. These stories feature a regular Nasat character, P8 Blue. The Vulcan city of ShiKahr also appears in many books. Paula Block, then of CBS Consumer Products, was responsible for approving proposals and all completed manuscripts for the licensed media tie-ins and granted many such uses of TAS material since Roddenberry's death. Amarillo Design Bureau has—as part of its license for the Star Fleet Universe series of games—incorporated many aspects of The Animated Series into its works, not least being the inclusion of the Kzinti, although in a modified form. In addition FASA used elements from The Animated Series in its sourcebooks and modules for its Star Trek role-playing game. Star Trek: Enterprise producer Manny Coto has commented that had the show been renewed for a fifth season, the Kzinti would have been introduced. Starship designs were produced which closely resemble the Kzinti/Mirak ships from the Star Fleet Universe, a gaming universe that includes the boardgame Star Fleet Battles and its PC analogue Star Fleet Command. On June 27, 2007, Star Trek's official site incorporated information from The Animated Series into its library section, clarifying, finally, that the animated series is part of the Star Trek canon. Both David Gerrold and D. C. Fontana have stated that the animated series is essentially the fourth season that fans wanted originally. The comic Star Trek vs Transformers was inspired by the animated series, and takes place in a similar universe. In 2019, CBR ranked all the seasons Star Trek television shows, placing Season 1 of TAS at 23, and season 2 at 24. At this time there was 31 season of Star Trek TV overall. The complete series was first released in the United States on eleven volumes of VHS tapes in 1989. In the United Kingdom, CIC Video released the complete series on seven volumes (1x4 episodes and 6x3 episodes) on PAL VHS in 1992. Although CIC-Taft Australia negotiated an Australasian release, they did not proceed with their plans. A boxed set of the complete series on LaserDisc was released for the US market in 1990, then re-released in 1997. A Region 1 DVD box set of the series was released on November 21, 2006, and has since been released internationally for other Regions. Each episode on CBS DVD/Paramount Home Entertainment’s Complete Series DVD release of Star Trek: The Animated Series (aka The Animated Adventures of Gene Roddenberry’s Star Trek) was presented in its original network television format and original airdate order - uncut and unedited - and also remastered and restored in 1080p HD and full-color with remastered and remixed 5.1 surround sound and restored original mono audio. It was also the last series of Paramount's Star Trek television franchise to be released to DVD. A Blu-ray release in HD was released as part of the STAR TREK 50th Anniversary TV and Movie Collection in the United States on September 6, 2016. A stand-alone Blu-ray release was released on November 15, 2016. ^ "Star Trek: 25th Anniversary – Review – Adventure Classic Gaming – ACG – Adventure Games, Interactive Fiction Games – Reviews, Interviews, Features, Previews, Cheats, Galleries, Forums". Adventure Classic Gaming. Retrieved May 5, 2013. ^ "Star Trek" – via www.imdb.com. ^ George Takei. To the Stars: The Autobiography of George Takei. Pocket Books. ^ D. C. Fontana (1991). Introduction to Star Trek: The Classic Episodes, Volume 1. ^ Lost PSA: Star Trek TAS for Keep America Beautiful!. YouTube. June 14, 2010. ^ Ayers 2006, p. 232. ^ Okuda & Okuda 1996, pp. 41–42. ^ "Star Trek: The Animated Series". startrekanimated.com. ^ "D.C. Fontana On TAS Canon (and Sybok)". TrekMovie.com. ^ "ShiKahr (background image)". TrekMovie.com. Retrieved May 5, 2013. ^ "'Star Trek: Discovery' References Spock And 'The Animated Series'". comicbook.com. Retrieved March 8, 2019. ^ "Star Trek: Enterprise". Memory Alpha. ^ "96, Star Trek: The Animated Series". IGN. January 23, 2009. Archived from the original on January 19, 2009. Retrieved January 23, 2009. ^ "Every Star Trek Season of TV Ever, Ranked from Worst to Best". CBR. January 4, 2019. Retrieved March 26, 2019. Alexander, David (February 16, 1995). Star Trek Creator: The Authorized Biography of Gene Roddenberry. Roc. ISBN 0-451-45440-5. Ayers, Jeff (2006). Voyages of the Imagination: The Star Trek Fiction Companion. Pocket Books. ISBN 1-4165-0349-8. Okuda, Mike; Okuda, Denise (1996). Star Trek Chronology: The History of the Future. Pocket Books. ISBN 0-671-53610-9. Wikimedia Commons has media related to Star Trek: The Animated Series.